Initiatives to replace chemicals with naturally occurring microbes in mine wastewater treatment are improving as researchers get a handle on how bugs thrive in situ. “Tailings and wastewater are biologically reactive because they contain a lot of materials and elements that are energy drivers for bugs, so there are lots of bugs that are happy to live in these environments, but we don’t really now how they operate – what are the drivers, what are the controls and what are the outcomes?” says Professor Lesley Warren, who holds the Claudette MacKay-Lassonde Chair in Mineral Engineering and is director of the Lassonde Institute of Mining at the University of Toronto. Acid Mine Drainage (AMD), the acidic metal-rich water formed when air and water react with rock containing sulphur, is an ongoing risk to streams, rivers, lakes and aquatic life worldwide. As water becomes more acidic, it can leach other metals out of the rock, causing additional toxicity if not properly managed. Warren and her team are focusing on bacteria that transform those sulphur compounds. Depending on the type of bacteria and the environmental conditions, bugs can either amplify or reduce contamination, so understanding how they operate at various temperatures with different rock types is essential to harnessing their power. That’s where genomics comes in. Microbes that live in wastewater are difficult to grow in the lab, but new technology (metagenomics) has allowed Warren and her team to extract and sequence DNA from microbes to determine their lineage. Some bugs may carry the gene for sulphur oxidation, for instance, while others may prefer to dine on nitrates. Just over two years after receiving $3.7 million in funding from Genome Canada, her team – co-led by Dr. Jillian Banfield of University of California, Berkeley – is making some breakthroughs. “This technology is profoundly altering our ability to interrogate these bugs in widespread mining environments,” Warren says. Her research is taking place at Canadian mines including Hudbay Mineral’s 777 copper-zinc mine and Anderson tailings facility in northern Manitoba, Glencore’s Sudbury Integrated Nickel Operations (INO) in northern Ontario and Rambler Metals and Mining’s Baie Verte copper mine in Newfoundland. The team has collected more than 300 samples at different points within these wastewater systems during different seasons. Even though the mines vary widely in terms of their ore types and how long they have been in operation, one genus of bacteria – Halothiobacillus – shows up consistently in the samples from every mine. 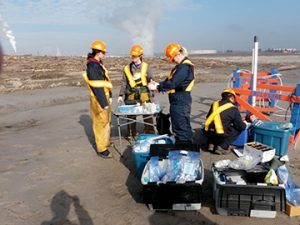 Just as significantly, the microbes differ from the sulphur-metabolizing bacteria that normally colonize waste rock sites, likely because tailings ponds have much more complex biogeochemistry than is widely recognized. Having this biological knowledge base also enables predictive modelling of what may occur in the wastewater system and improves monitoring tools. During their research, Warren’s team has discovered that conventional analysis of wastewater at commercial labs fails to capture all of the reactive sulphur, so mines may be underestimating their sulphur risk. Labs also use different methods, so there is no consistency in results from mine to mine. Warren is proposing a new methodology that will introduce universality and allow mines to fully constrain the sulphur in their waters. Biological solutions for treating mining wastewater at also being developed by industry and Teck is emerging as a leader this regard. The company has successfully piloted a new method of removing selenium and nitrate from the mine water at its Elkview steelmaking coal mine in British Columbia. The method uses Saturated Rock Fills (SRF), and is currently treating up to 10 million litres of water per day from the mine using naturally occurring biological processes. Teck commissioned the SRF facility in 2018 on a previously mined pit that had been backfilled with rock and flooded with water, using nutrients such as methanol and phosphoric acid to accelerate microbial activity and contaminant removal. Capital and operating costs are 20% and 50%, respectively, of conventional techniques with similar capacity because there is no need to build a plant and the fill can be expanded quickly if necessary. The company is currently focusing on using the technology in the Elk Valley where the need is most immediate but has not ruled out using the new treatment method elsewhere in its portfolio of mines. The SRF initiative is one component of Teck’s Elk Valley water quality plan approved by the British Columbia government in 2014. The plan is a long-term approach to addressing the management of selenium and other substances released by steelmaking coal mining and affecting the water quality and aquatic life throughout the Elk Valley watershed. Teck owns five large open-pit steelmaking coal mines in the valley and has inherited a legacy of waste rock from more than a century of coal mining there. The $850-$900 million five-year plan (2018 – 2022) also includes an active water treatment facility at the West Line Creek operation that treats up to 7.5 million litres of water per day, reducing selenium concentrations by about 96% and nitrate concentrations by 99%, and a similar facility being built at the Fording River operation. As for research and development, Teck has several projects underway to better control the release of contaminants at source and to develop new water treatment methods. Active treatment, where wastewater is collected and then chemically treated, is expensive and labour intensive, so the development of an effective treatment in situ is a leap forward. If Teck can permit more SRF projects to replace the upcoming active water treatment plants in the Elk Valley, the company estimates that total capital spending on water treatment could drop to $600-650 million during the five year period. “Teck had enough understanding in terms of the linkage between opportunities around using bacteria to treat wastewater and potential outcomes to set up full scale treatment and see what happened,” says Warren of Teck’s SRF pilot. As for Warren and her team, they will be setting up a test pond at Glencore’s Sudbury INO this summer to test the their hypotheses about potentially useful biological indicators and to see if they can predict and promote reactions, both good and bad. “The application of genomics in industry is profoundly important and it will lead to new ideas about how to manage waste and wastewater much more successfully,” she predicts.